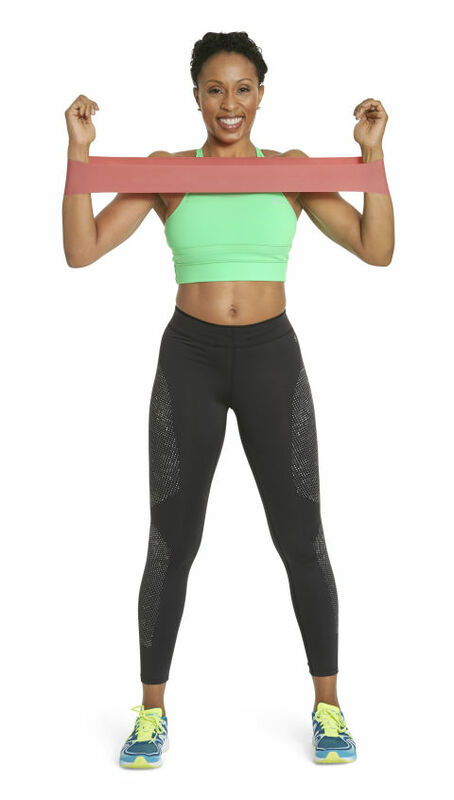 3 Ways to Tone Back and Bra Bulge | Latreal: All you need is a circular resistance band and these targeted do-anywhere moves. 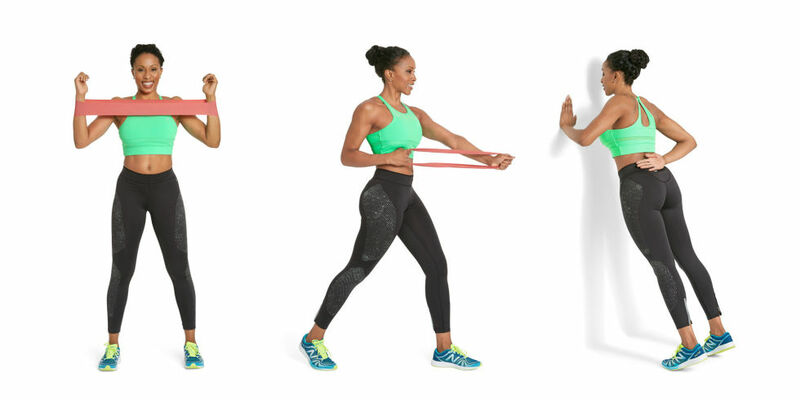 3 Ways to Tone Back and Bra Bulge All you need is a circular resistance band and these targeted do-anywhere moves. Repeat this routine two to three times a week, three times through. A circular band works best — we like the Spri Flat Band Loop (medium resistance, $10 at spri.com). Standing with feet hip-distance apart, loop band around wrists, then raise elbows to just below shoulder height and bend arms 90 degrees. Spread arms into goalpost position (as shown). Hold for one count, then bring arms back to shoulder-width apart for one rep. Repeat 12 times. And pay attention to your posture: Drop shoulders down and squeeze shoulder blades together. Stand with feet staggered, left foot ahead of right, holding band with both hands extended just below chest level. Keeping left arm straight, pull right fist to rib cage (as shown). Straighten right arm to match left for one rep; do 12 reps. Switch sides and repeat. Engage your abs to ward off wobbling. Stand arm’s length from wall at chest height, left palm flat against wall, right arm behind back. Step both feet back and rise onto toes. Bend left arm (as shown), then extend it to return to start. Repeat 12 times; switch sides. To avoid wrist strain, spread hand and keep fingers pointing up, not to the side. his story originally appeared in the February 2016 issue of Good Housekeeping. This story originally appeared in the February 2016 issue of Good Housekeeping.